AIIMS PG Admit Card 2019: The All India Institute of Medical Sciences has released the admit cards for January session on its official website today. Candidates can check the official website - aiimsexams.org and download the same. AIIMS PG Admit Card 2019: The All India Institute of Medical Sciences or AIIMS has published the Admit Card for the January session Postgraduate entrance examination on its official website aiimsexams.org today, i.e. on November 8, 2018. Candidates who have filled up the application form for the examination are advised to check the official website and download the Admit Card released by the authority. According to reports, the AIIMS PG January session examination is all set to be conducted on November 18, 2018, for those candidates who are willing to take admissions into the Postgraduate programmes under the Institute. Meanwhile, the examination will be a Computer Based Test with Multiple Choice Question or MCQ based where around 200 questions will be asked for MD/MS while 90 questions will be asked for MDS courses. as per reports, the results of the AIIMS PG January Session Exam 2019 will be announced on November 23, 2018, through the official website of AIIMS. Candidates are advised to keep checking the website for more information regarding the PG entrance examination. 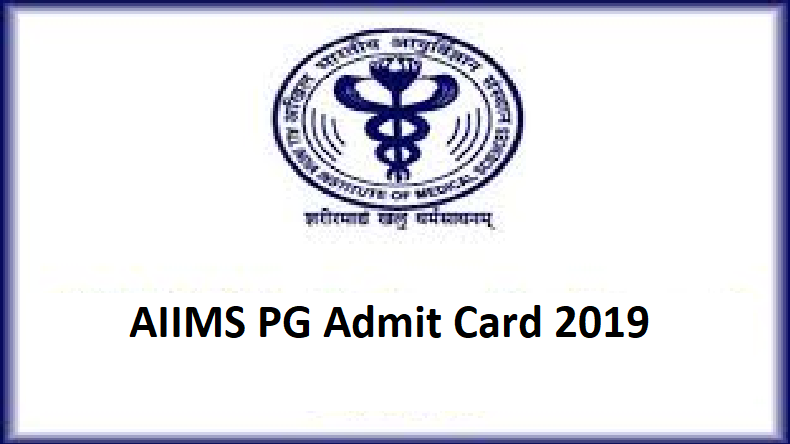 How to download the AIIMS PG Admit Card 2019?